PMSC is a cause-oriented organisation that promotes the rights and welfare of Filipino migrants in Canada. The goals of PMSC are to organise, mobilise and educate overseas Filipinos on the issues of migrants and the Filipino people in order that they are better able to defend their rights. PMSC was initially known as the Philippine Multicultural Society of Canada. 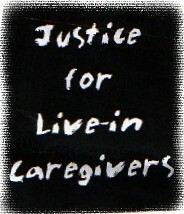 It was set up in 1996 as a support group for Filipino domestic workers and live-in caregivers. The initial objective of the organisation was to work toward the integration of all Filipino Canadians and other ethno-cultural groups in the economic, social cultural and political life in Canada. In the year 2000, PMSC changed its name to Pilipinong Migrante sa Canada, and renewed its mandate and broadened its focus. Its membership base now includes all migrant Filipinos. Join PMSC every First Sunday of the month for its Workshop Series. Our workshops provide information about the rights of migrant workers in Ottawa. We specifically focus on how we can enforce these rights.